This new addition to the Images of War series is sure to prove welcome, illustrating as it does the preparatory stages of the iconic Battle of Britain. Whilst the country geared up for action, the air forces rallied, readying the high-performance Hawker Hurricane and Supermarine Spitfire fighters that were to characterize this aerial conflict so dramatically. The nine month period that elapsed prior to the German dive-bombing attacks on British shipping in the English Channel (an event that signaled, what Winston Churchill labeled, The Battle of Britain) is the focus of this photographic study. The so-called 'Phoney War' that played out under the leadership of William Maxwell Aitken, the British Minister of Aircraft Production, saw all arms of the Air Force tasked with the job of ensuring that Britain and its forces were prepared for the German challenge that existed on the horizon. Images of some of pilots and various aircrews preparing for battle feature alongside shots of Spitfires in waiting, volunteer ambulance crews in readiness, civilians filling sandbags on the beaches of Britain to be used in an effort to protect its buildings. All these images serve to illustrate the times at hand, and the co-operative, resilient spirit of British pilots and civilians during this anticipatory period of uncertainty. Military enthusiasts and historians of the Second World War will be intrigued by the new insights opened up by these images. All are accompanied by Kaplan's illuminating prose, setting each image within context. 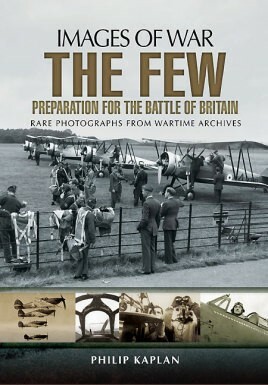 A second volume will follow, focussing on the Battle itself, and The Few who achieved so much.